The Moon is the eighteenth trump of the Major Arcana, which in most traditional decks is associated with Pisces. 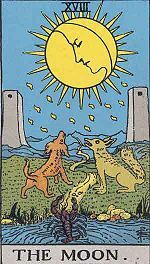 In the Rider Waite Tarot the card depicts a dog and a wolf baying at the Moon, while a crayfish emerges out of the water and takes its first step on a pathway leading beyond a large gateway of two towers. The landscape is dark and gloomy, with a waxing and rather frowning Moon shining with sixteen chief rays and sixteen secondary rays, and shedding drops of luminous dew. In the The Pictorial Key to the Tarot, A.E. Waite describes the Moon as the representation of life of the imagination apart from life of the spirit. The setting looks desolate and obscure, illuminated only by the light of the Moon, which is the result of a reflection and therefore illusory and easily misleading. Despite this noticeable anguish, the Moon is a zone of major power and a great learning path, if one is not swept away by the intense emotional turmoil that this trump can potentially manifest. This is an area where the structure of the ordinary world and all the illusions that characterise this separated reality simply crush and melt away. Yet the alternatives may be insanity, addiction, despair and the most dramatic forms of psychic disturbance, unless the individual is firmly grounded on the healing path. 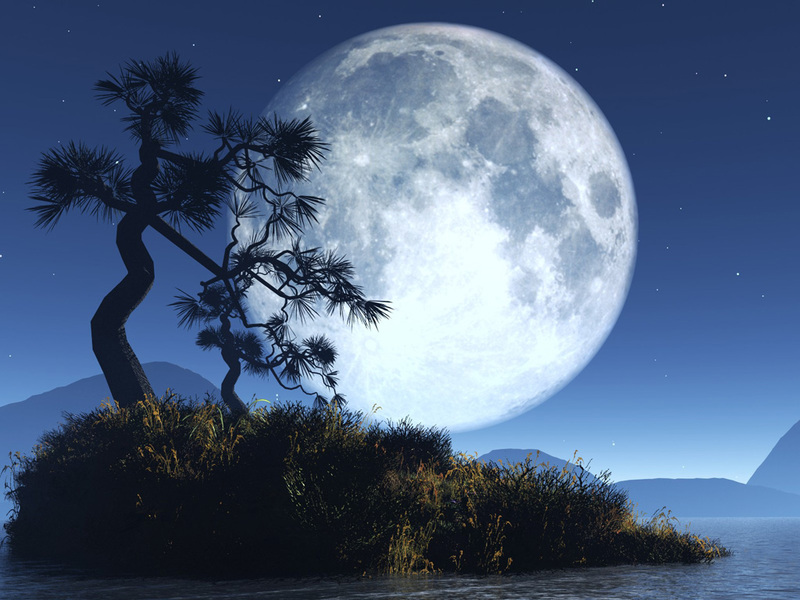 The Moon activates processes of huge release of unconscious energy that drastically dissolve the ego identity. This may involve shape-shifting and other radical transformations, which pertain to the realm of shamans. It is an out of bound area accessible only to those who can move beyond their identification with consensus reality. When this is not the case the Moon elicits most devastating consequences from the illusive perspective of the ego self, and yet this is what can also bring about a healing crisis, a shamanic initiation, if the individual involved does not succumb. When the Moon shows up in a reading it may indicate a challenging emotional situation, a state of deep confusion, fear, uncontrolled excitement and cravings, which might lead to escapism and various perilous addictions. The setting of the card may seem rather threatening, yet real risks develop only if we lose our awareness and become too reactive or passive. Things immediately change when instead of being the victim of the Moon’s environment, we decide to hold and direct its force. The Moon is not there to frighten or confuse us. It is an immense source of energy, which usually causes havoc simply because our culture and social make-up is based upon its ongoing denial. The Moon merely unveils one of the two sides of our being, and causes problems only when we do not acknowledge that side. Yet, those problems are solely the result of our ignorance and limited perception of who we are. The Moon exemplifies whatever is unconscious, the unknown, the dark, and this includes also the realm of dreams and sleep. The Moon conveys the emergence of a tremendous amount of energy, which can either overwhelm and destroy or empower and fortify. This basically depends on what we do with that energy. And here the best way to deal with the Moon is to be aware of our intention. Working with an intention is the best protection for any type of emotional turmoil. This establishes a focus, which not only shelters us from undesired forces, but also draws the energies that are most beneficial in the pursuit of our intent. There are basically two things that can happen when the Moon is at work. We can either react with addictive, disruptive and unsocial behaviours or embrace the power of the Moon with creative and healing activities. The Moon is simply the other side of the Sun, the night force as opposed to the light energy. Both share an equal amount of influence through our life, yet if the lunar side is denied, as it is often the case, once it manages to erupt into our consciousness, it appears devastating. In the long run the Moon cannot be overlooked, and it will find a way to be seen. In actual fact, all the pent-up feelings will build up to an overt and undeniable crisis, a lunar burnout. This is the case for people who are mainly focused on the solar side. The Sun gives only one part of the picture, and there is much more in our individual make-up which continues to feel and act, though it goes mainly ignored, until it cannot be ignored anymore. There are also many folks for whom the Moon energy largely prevails on the Sun. They are ruled by the Moon and yet they are not aware of it, or are forced to come to terms with a world that does not fit with their strong emotional nature. Being a Lunar type in a Solar World, which is the title of an inspiring book by Donna Cunninghan, is certainly a challenge, and yet when this is eventually acknowledged and mastered the Moon side is bound to become a major source of power. In Robert Places’ Tarot of the Saints, the Moon is represented by Mary, the Madonna. Mary’s cult was initially discouraged by the Church for fear that she would surpass Jesus. Then from the sixth century she was given full status and was officially named “Queen of Heaven”. As such she is depicted with the moon under her feet and a crown of twelve stars. This is a reference to Revelations 12:1, and to more ancient depictions of the lunar goddess. 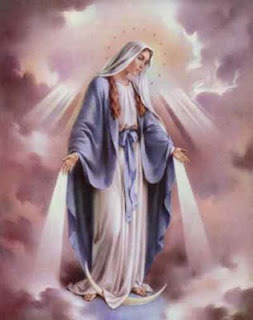 Mary is also acknowledged as the “Mother of God” (Theotokos) and the matrix of God’s grace and forgiveness. It is the lunar world that produces the solar world, which are constantly interrelated no matter whether one world appears to prevail on the other. Despite being portrayed with the Moon, Mary is also often surrounded by a Solar nimbus (as in the image of Our Lady of Guadalupe), identifying her as the Supreme Solar Deity, rather than the classic patriarchal representation of the lunar feminine qualities. Towards the end of the novel The Mists of Avalon, when Morgana visits a Christian convent she says “it is in Avalon, but it is here. It is everywhere. And those who have need of a sign in this world will see it always”. The Moon principle lives everlasting and will always be there, shape-shifting in any available role. In the television miniseries based on the novel, Morgana says this while watching people praying to the Virgin Mary, and she adds “Exile her as they may, she will prevail. The Goddess will never withdraw herself from mankind”. Moving beyond the illusion of duality, the two polarities will ultimately merge into a third pole, which gloriously encompasses and embraces both. Please be aware that the articles in this series are merely an introductory overview on the topic. More plausible implications of the astroshamanic voyage through the Tarot are provided with experiential sessions or specific training. For a complete list of Astrology and Tarot correspondences according to the model used in these articles please click here. For the introductory article to this series pleased click here. Click here for a calendar of astroshamanic events. For a selection of books on the tarot, please click here.